With such high standards being taught at every grade level, we wonder; what can a below-level language learner do in a grade-level class? What can students who are SIFE do in the middle school social studies class? Or the high school biology class? These tasks engage students who are SIFE at some of the highest cognitive levels we ask of our mainstream, grade-level learners. In the sections below we will discuss ways to develop academic language for students who are SIFE while engaging them at a high level of cognition. Though receiving comprehensible input is critical in the language acquisition process, encouraging language output is also highly significant. When I provide professional development for teachers, I consistently echo the mantra: When students verbalize, students internalize. We encourage our students to speak in complete sentences, so they can practice proper academic language that can also transfer to academic writing. We teach our students that they can truly understand something when they can explain it. We also want to emphasize why it is so important to create as many opportunities for students who are SIFE to produce English. From their perspective, they care about how they sound. From our perspective, we want all students to build oral language. The story of Gerson works to help teachers realize the value in having students who are SIFE engaging in various activities that encourage oral language production. I had shown my students the video of Gerson Bermudez more than once. This video of an actual immigrant student, reflecting on how he accelerated his English language acquisition, has never failed to have an effect. Students and teachers alike are inspired by the evidence of how a growth mindset can help us improve our learning at a rapid pace. 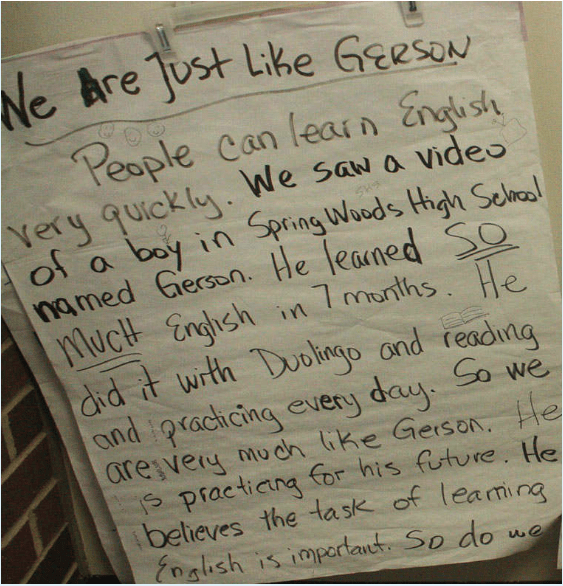 Because of this, our class often discusses how we are similar to Gerson and what steps we should take to improve our own English. This study of a real student overcoming the challenges of being a recent immigrant was highly engaging for my students. To meet speaking goals, I asked my students to think of questions they had for Gerson. I knew they would be compelled to produce language with an opportunity to communicate with him. Some of their questions needed to be translated but they practiced what they wanted to ask in English. This went well and it was fascinating to see how many of the students had questions about pronunciation and sounding like a native English speaker. Many wanted to know if he still had an accent and if not, how did he lose it? They wanted to know what he did and how long it took. I love Gerson’s reply to them. He explained that he still had his accent and he was happy to have it. He explained that it defined who he is, and often opens doors to discussions about culture. One approach to scaffolding student/student conversation is Q, Triple S, A. 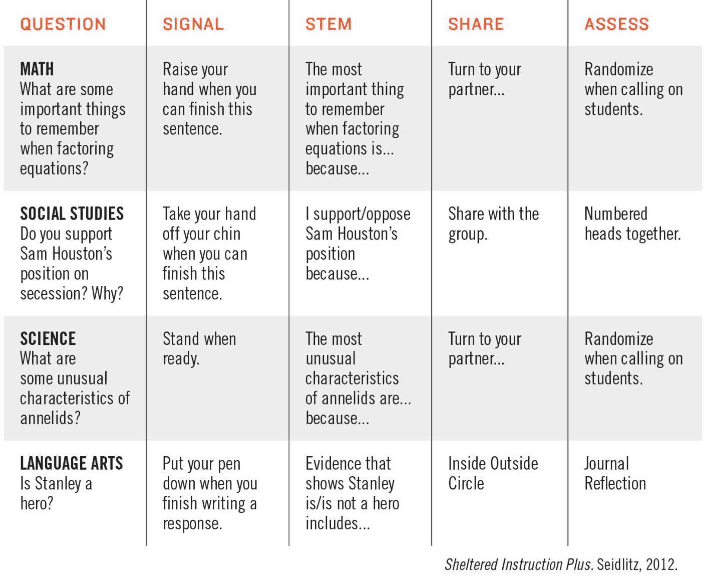 The acronym stands for Question, Signal, Stem, Share, Assess (Seidlitz & Perryman, 2011). This activity gets students using all domains of listening, speaking, reading, and writing in a fun and interactive manner. QSSSA is beneficial for students who are SIFE because it occurs in a low-stress environment, where students have the wait time to negotiate meaning and practice responses with a partner before sharing chorally with the class. Students are guided in their structured conversations by sentence stems and precise, easy-to-follow directions from the teacher. WHAT DOES QSSSA LOOK LIKE? This structure begins with the teacher asking a question. This is a great way to help students build academic language into their writing. The activity ends with the teacher assessing the students by randomly calling on a few to respond, or rotating around to each group and asking for a response. See the chart on the next page for an example of the different variations that QSSSA can be used in different content areas, with varied response signals, stems, and methods of formative assessment. WHAT IS ROVING PARAGRAPH FRAMES? Roving Paragraph Frames is an activity that combines listening, speaking, reading, and writing in an engaging format to benefit all learners. For ELLs, it is essential to practice speaking and writing in English, especially in an environment that lowers the affective filter (see page 54) and enhances the ability to produce low-stress output. For SIFE and under-schooled students, the advantages of this kind of engaging learning environment eases learners into a classroom culture that is interactive and encouraging of language practice and growth. This activity is successful because of its effortless use of grouping, randomization, structured conversations, and structured reading and writing opportunities. To give students who are SIFE as much exposure to various models/examples of spoken and written English, experimenting with various grouping structures is an excellent way to enable this practice in a low-stress environment. WHAT DOES ROVING PARAGRAPH FRAMES LOOK LIKE? This activity is excellent for all students and works very well for English learners. We first explain the activity and then provide an explanation of how it can be modified if you have non-English writers in your class. Ask the students to stand up with their paper and pencils when they have completed the written sentence. Have the students “rove” around the room and find a partner. Ask students to read their writing to one another. The first person reads his/her complete sentence, stem and all. The second person listens and then reads his/her complete sentence. Ask students to write a new sentence that begins with a new stem, such as “In addition, __________.” They can either “borrow or steal” their partner’s response if it was different than their own or just create a fresh sentence. Once sentence #2 is complete, partners raise their hands or stand back to back. The key here is to incorporate total response signals to indicate to the teacher that the task is complete. Now they are ready to rove again. To conclude, have students repeat the process one last time and rove to find their final partners. Once individual sentences are read aloud by each partner, ask students to write the final sentence using the last stem “Finally, _______.” At this point, each student should have a well-constructed paragraph in hand, complete with transitions and complete thoughts recorded in academic English. Content teachers should be mindful of students who cannot yet write in English. For these students, you may decide to cluster them into a group so that you can work with them while the rest of the class is writing their initial sentence. You can use a native language peer, a bilingual dictionary, or translation app to get the students’ ideas and help them complete the sentence frame. If the student is very new, it is beneficial to provide these students with the rest of the sentence frame so that they can participate with the rest of the class. You may also consider partnering your students for this activity so that your brand-new students are less apprehensive about roving and speaking. However you scaffold for your students who cannot yet write in English, know that the activity is still very meaningful for English language goals at the beginner writing level. If it is early in the school year, it is possible that your class with SIFE learners has a considerable number of students who are not able to complete sentence frames with coherence in the target language. Students should soon be able to complete simple sentence frames, but the reality for some of us is that we are receiving newcomers all the time and our classroom may be made up of many students who cannot yet write in English. Instead of having this activity become confusing for the class, consider taking a more guided approach to Roving Paragraph Frames. After my first attempt ended in a bit of frustration for all of us, I altered the way I facilitated the activity and used QSSSA (page 66) to scaffold for my new arrival class. Have students in cooperative groups. Give the class the first sentence stem to begin the activity. Use visuals and other sheltered strategies to make the stem comprehensible. Allow native language discussion and use of translation devices. Have students work in groups or pairs and ask them to develop a complete sentence using the frame. Advise them that you will be randomly calling on them. Have groups give a signal when they have completed the frame. Randomly call on groups to give their sentences. Teacher scribes sentences on board to model English writing. Allow each group to offer a sentence and more if time permits. Chorally read sentences with class and use sheltered strategies to ensure comprehensible input. Invite students to choose any sentence from the board to be the beginning sentence of their Roving Paragraph Frames. If students have enough writing proficiency, they can use their own words to write their sentence. Tell the students “rove” around the room and find a partner. Ask students to write a new sentence that begins with the next stem, “In addition, __________.” They can either “borrow or steal” their partner’s response if it was different from theirs, or use one from the board. If they have more writing proficiency, they can write their own original sentence. Students find new partners, and repeat the entire process with the second partner. It is crucial to instruct students to read everything they have written so far, and for the partner to listen and then read everything that he/she has written so far as well. This validates student responses, and encourages the use of listening and speaking skills. After reading individual sentences, students write a third sentence with the stem “Finally, _______.” At this point, each student should have a well-constructed paragraph in hand, complete with transitions and complete thoughts recorded in academic English. This activity works well at any point in the lesson cycle. It can be used as a warm-up activity, a transition midway through a class period, or as closure to review the day’s concepts and learning. Another perk is that you can use this structure to have your students practice other transition words, not just in addition, also, and finally. Sarah Russell, a former English teacher in Reno, NV created a list of signal words that might be useful. 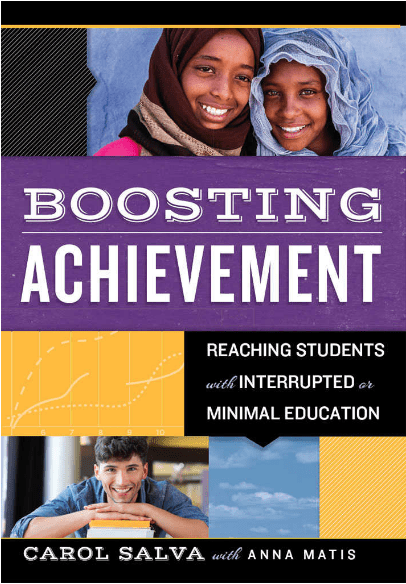 Boosting Achievement by Paul is licensed under a Creative Commons Attribution-ShareAlike 4.0 International License.